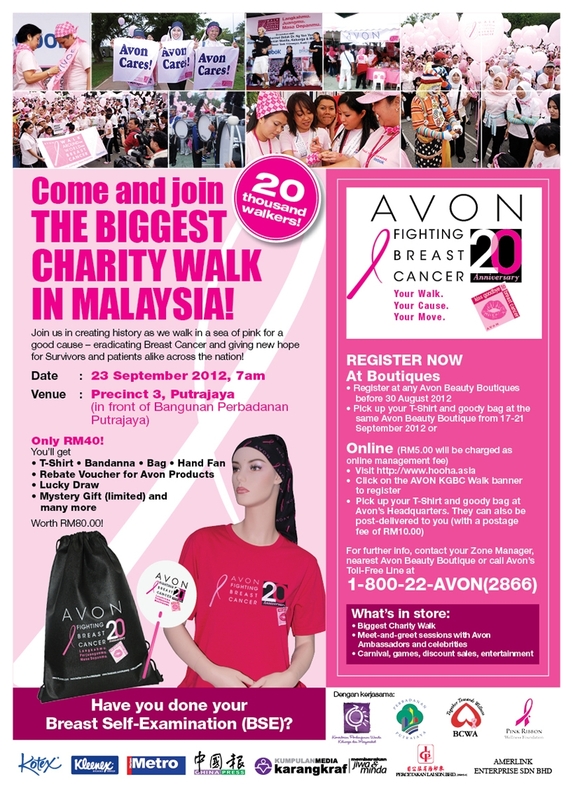 Priced at RM40, tickets are available at all Avon Beauty Boutique nationwide. Or you may book online at http://www.hooha.asia. For more details, call Toll Free at 1800-22-AVON(2866) or www.facebook.com/AvonMy. Tickets are also available at all Avon Boutique (list of boutique is available at http://www.my.avon.com/PRSuite/beautycenters.page). Participants will receive goody worth RM80 which include a t shirt, bandanna, hand-held fan, Avon rebate vouchers and goodies from Kleenex and Kotex. Nett proceeds will go to Breast Cancer Welfare Association (BCWA) and Pink Ribbon Wellness Foundation. Hope you can support this event!